14K Yellow Gold Over. Note : All Designs Are computer generated designs. Original Product Might look little different than this. This solid handmade ring is perfect gift for the significant other, or special best friend, they can wear it as wedding rings or to complete their formal or casual wear, The joy of a handmade ring is it's unique design, and it makes an interesting conversation piece. We advise removing this ring when being exposed to any type of substance or chemical. The images uploaded will not match exactly with the Original products as the images are Edited. There are 6 total diamonds. This set has not been soldered together. It is currently sized at a 5. The set is in very good condition and weighs 3 grams. GMARCH, G106175. 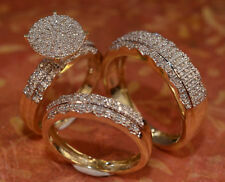 ROUND DIAMOND BRIDAL SET. STUNNING 14K WHITE GOLD. MADE IN SOLID 14K WHITE GOLD. 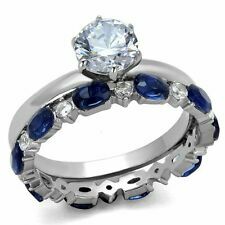 RJ JEWELRY was established in 1995. 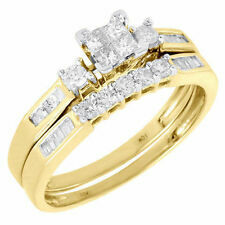 We giveloans on almost anything of value such as diamonds, gold, electronics, tools, & more. Signity Diamond's are bright white man made diamonds with more sparkle than natural diamonds. 14K White Gold. Princess Cut. They are bright and sparkly and display more fire than the best grade of diamonds as shown in the table below. Tungsten is stronger than titanium and heavier than platinum. It is polished to a perfect finish using diamonds. The only way to scratch tungsten is with a diamond. 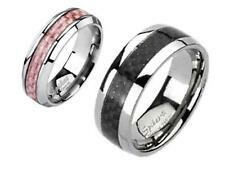 Tungsten bands are designed to be maintenance free. 10K White Gold Over. Cushion Cut. Signity Diamond's are bright white man made diamonds with more sparkle than natural diamonds. They are bright and sparkly and display more fire than the best grade of diamonds as shown in the table below. Together they create a flower with leaves motif. 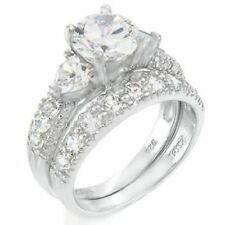 The center is a round brilliant cut diamond weighing 1/5 carat. The diamonds have an I1 clarity grade and an H-J color grade. The diamonds sparkle in the light. If you like to make any changes to be made on a particular product of ours for ex. We advise removing this ring when being exposed to any type of substance or chemical. We advise removing this ring when being exposed to any type of substance or chemical. Simulated Diamond. What is Signity Simulated Diamonds?. 14K White Gold. Princess Cut. Signity Diamond's excellent cut is equal to ideal cut diamonds, the best cut for reflection and loop clean. Color Stones Change (White Topaz, Blue Sapphire, etc). 10 Baguettes - 30 Points. 30 TCW. 12 Rounds - 20 Points . 20 TCW.